Cheek implants are an effective method towards enhancing the shape, contour, and balance of a persons face; providing a new sense of symmetry. This can be done in a variety of ways, using synthetic materials like Alloderm, silicone, or Gore-tex. For a youthful, healthy-looking appearance, cheek implants may also be created through the use of fat injections. This procedure can improve a sunken or tired look. Temporary bruising, swelling, numbness, tightness of skin, and restriction of chewing. Dietary restrictions and activity limitations depend on whether another procedure was performed with your surgery. The ability to move your mouth and lips may be diminished temporarily. Recovery time should average about 1 to 2 months. Return to work: 1 to 2 weeks after surgery. Possibility of infection (which may require cheek implant replacement) and improper placement (possibly leading to repositioning through a second operation), hematoma, numbness from nerve damage. Cheek implants are permanent, depends on the material used and whether a revision is necessary. If cheek augmentation is performed with other cosmetic procedures, such as a facelift, forehead lift, or eyelid surgery, the implants may be inserted through the same incisions. Reshapes the chin by inserting an implant or performing reduction surgery on the bone. 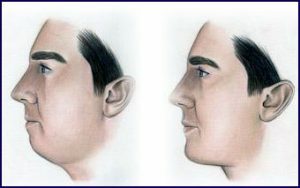 Chin augmentation is often done in connection with a nose job (rhinoplasty) or a full face lift. Implants may include solid silicone, bone or fat from the patients body. A half hour to about 2 hours, depending on individual circumstances. Difficulty talking and smiling for several days after surgery. If you have intra-oral sutures, a patient may be placed on a liquid diet for several days. If a patient has intra-oral sutures, he or she may be placed on a liquid diet for several days. Patients can usually go back to work within a week and resume workouts after about 2 weeks. Possible bleeding, infection, facial numbness or reaction to anesthesia. Permanent, but results may require several months to become fully visible. Bone and fat implants can possibly be reabsorbed into the body. Some chin implants are inserted through the inside lower lip (intro-oral incision) to avoid facial scarring. Chin augmentation is often combined with liposuction to remove fat from under the chin and the neck. Outpatient – Usually outpatient in a surgical suite in the surgeons office, or inpatient at a hospital if youre having several procedures.